posted: October 26, 2017 by: Animal Hospital of New Albany Tags: "Clinic Specials" "News"
Canine influenza is a very contagious virus that has been seen sporadically throughout the United States. There have been several confirmed cases in the central Ohio area. It causes severe respiratory disease. "Dog flu" is a virus that has to run its course, and there are no drugs that will "cure" it. Our office will treat the symptoms of the dog, whatever they may be at the time, which could include lethargy, coughing, runny nose, fever, or even pneumonia. The virus is spread by airborne secretions such as coughing and sneezing. It cannot be transmitted to humans, however it can be transmitted to cats as well as to dogs. Our office has been vaccinating for the canine influenza since March 2011. We have required all boarding and grooming dogs to be vaccinated. 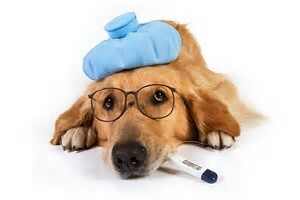 If you have not had your dog vaccinated for canine influenza, we highly recommend that you do so as soon as possible. One initial vaccine is given, followed by a booster 2 to 4 weeks later. Even with the vaccine, dogs can still get the flu, but it's usually a very mild form. Dogs that have NOT been vaccinated can get a very severe form of the virus and it could last 2 to 3 weeks. If your dog is coughing and showing any of the symptoms mentioned above, we ask that you call and make an appointment with us as soon as possible. Do not bring a coughing dog into the building. Call and let us know that you are here, drive around to the back of the building, and we will see your dog at your car. We are doing everything we can to help keep this virus contained. You can do your part by vaccinating your dog for canine influenza, and keeping your dog away from places where there are dogs that aren't required to have the vaccination. Call us if you would like more information!